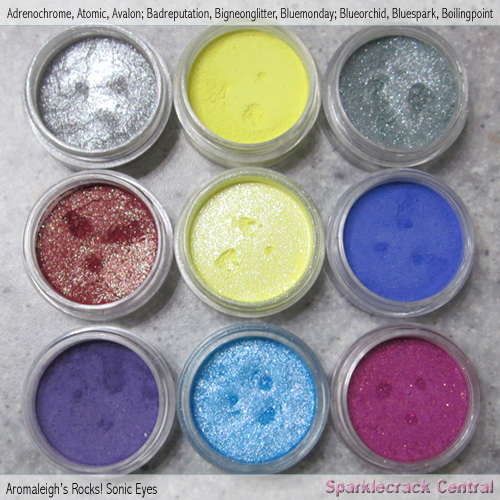 NOTE: All information on this page refers to the Rocks Sonic Eyes shades available from late winter 2007 to spring 2010. 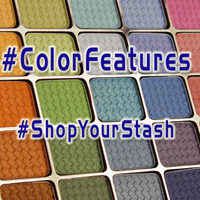 For anyone who's long since wanted brighter MMU colors, check out the Sonic Eyes collection. 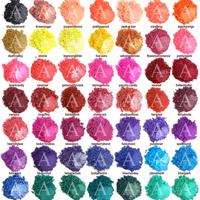 You've got over 80 shades in every color imaginable, in all finishes. 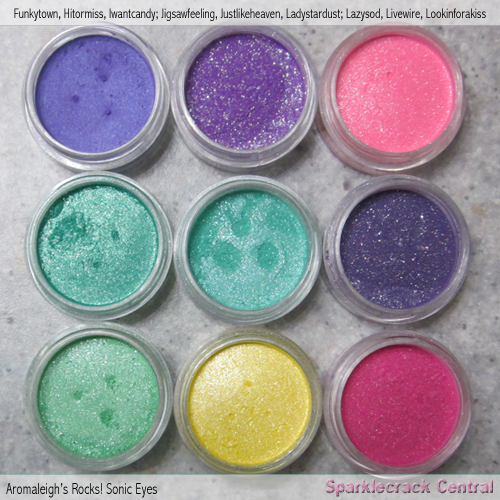 And this is part of Aromaleigh v1's regular line, unlike so many kits and collections that are available for a month or two...and then are gone. 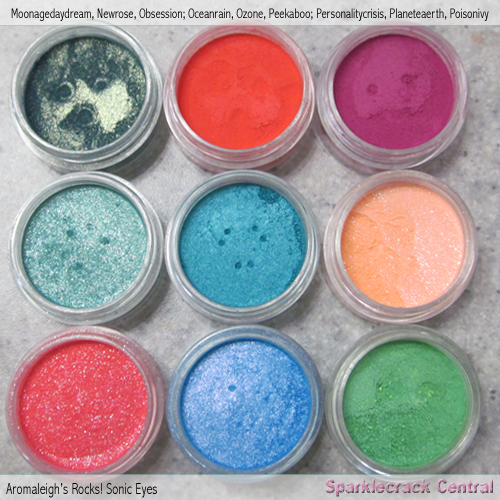 NOTE: some folks decided that since these colors were blacklight reactive, they must have contained substances that were not FDA approved for cosmetic use, or for use near the eyes. The ingredients for Bluemonday are listed (on the jar label) as: "mica [CI 77019], titanium dioxide (CI 77891], iron oxide [CI 77491, CI 77492, CI 77499]. 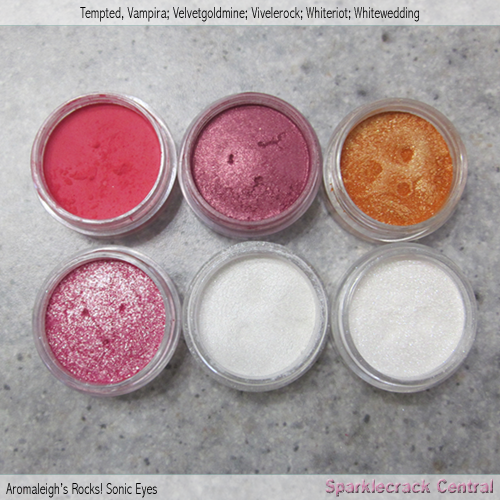 May contain polyester-3, D&C yellow 5 and 11, D&C orange 5, D&C violet 2, D&C blue 1, D&C red 22, 28, and 40; calcium sodium borosilicate, ferric ferrocyanide [CI 77510], tin oxide [CI 77861]." That "may contain" notice is like notes on chocolate bars that say "prepared in a facility that was also used to prepare nuts". It's so that violently allergic people know to avoid the product if even a trace amount of the listed item - which is harmless to the majority of the population - may kill them. 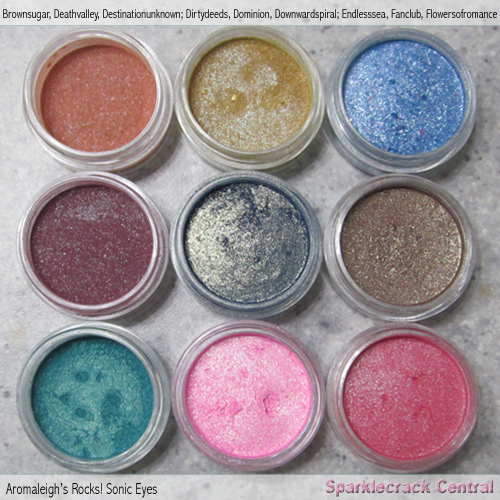 Same with Rocks colors and the D&C lake dyes: to many people, these dyes cause no problems; but to others, even the most minute quantities of these substances can cause reactions ranging from undesirable (temporary staining of the skin) to damaging (allergic reactions, rashes, inflammations). 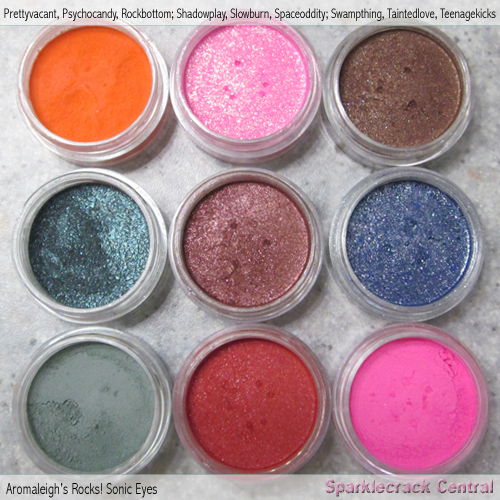 The Sonic Rocks collection does also have rouges, lip colors, body powders, and "glam glitter" eyeshadows. All are part of the regular line.